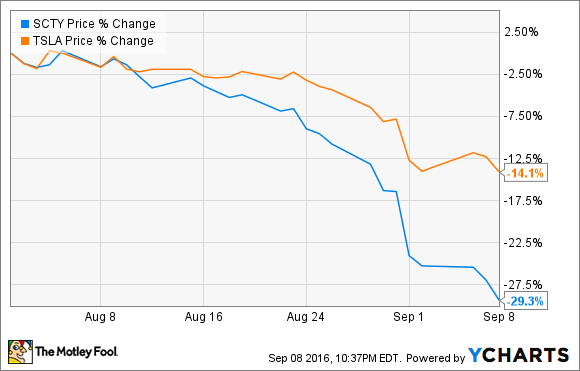 Could SolarCity Corp's buyout be in trouble after a big drop in the stock? Shares of solar installer SolarCity Corp (NASDAQ:SCTY.DL) dropped 22.6% in August, according to data provided by S&P Global Market Intelligence, as the company's sale to Tesla Motors' (NASDAQ:TSLA) starts to look less likely. The story of SolarCity is linked directly to Tesla Motors these days, since the auto company is in the process of buying the solar company. Tesla is offering 0.11 shares of stock for each share of SolarCity, and as a result the stocks should be trading in tandem. Since the beginning of August, however, Tesla stock has been dropping, and SolarCity is dropping even more -- meaning investors aren't confident the deal will go through at all. There are a number of problems facing SolarCity today, and they're converging as Tesla investors prepare to vote on the buyout. The cost to sell solar systems is rising, financing costs are going up, and SolarCity is burning through hundreds of millions of dollars in cash with past financing sources drying up. As SolarCity's stock falls, it looks less likely the sale to Tesla Motors will go through. Otherwise the shares would be trading together. But the bigger concern is SolarCity's uncertain future given the business' fundamental weakness, which should be investors' biggest concern today.